It was a Saturday afternoon in November, and I was sitting at the dining room table eating a peanut-butter-and-banana sandwich. As I leafed through an issue of Reader’s Digest, I came across this thought attributed to Leigh Hunt: To receive a present handsomely and in a right spirit, even though you have none to give in return, is to give one in return. As I was pondering that statement, I looked out the window and watched a scene playing out in the yard of the house across the street. The Hansen’s, a young family of four, had recently moved into that house and I knew they were away for the day. A car pulled into their driveway and an elderly man got out, removed a potted plant from the trunk, walked to the front door and rang the bell. He waited few moments before he realized for himself no one was home. He didn’t seem to know what to do next. He turned and started for the car, then stopped in his tracks, repeating this minuet several times. Should he leave the plant on the doorstep? No, he finally returned the plant to the trunk and drove away. Was the plant meant to have been a housewarming gift? Was someone ill? Who had the visitor been? Was he a friend of the family, or perhaps a relative? Why didn’t he just leave the plant? Was it because he didn’t know if the family would be returning shortly or if they would be away all weekend? Was he concerned someone else might take the plant? Was it important the Hansen family know from whom the gift came? Did this visitor need to speak with the family, so that merely leaving a note with the plant would not have been a solution? Should I have run across the street, introduced myself, explained that the family was gone for the day and that I would be glad to take the plant and deliver it to them when they returned? This mini-drama has made me wonder, at this gift-giving time of year, about how it is that we give and receive gifts. What makes a good and gracious receiver? What makes a generous and unselfish giver? Is it really more blessed to give than to receive? Is it easier to give than to receive? What is the motivation behind our giving? How does the Lord want us to receive His gifts? Is it important we know they come from Him? If so, how and when does He let us know? Do we receive His gifts in a right spirit? What gifts do we have to give Him? Do we give Him those gifts? So many questions – questions that each must answer for one’s own self. Do you wonder, as I do, if the visitor with the plant ever returned to the house across the street? Did the Hansen family ever receive his gift? 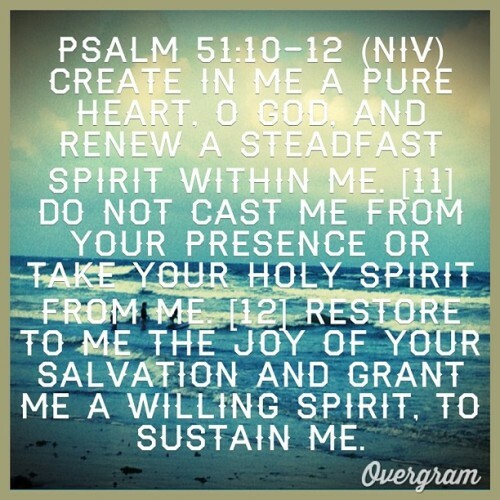 Take a minute to read Psalm 51: 10-12. There are answers to be found there.